Remember what we wrote a couple weeks ago about vendors and videotaping the police? Well, one brave ice cream vendor did capture his encounter this summer with an especially rude NYPD officer. It’s pretty powerful. We wrote a blog post about it, posted it on Youtube and it went viral, getting picked up by various web sites and papers around the world and making the nightly news. Apart from raising attention about the shocking way vendors are disrespected, hopefully the video will help spur reforms at the higher levels of the NYPD. Because vendors are often accused of peccadillos like vending from a table an inch too high, we train our members every day in how to make photos or videos of their interactions with police. That’s often the only way the tickets will get dismissed. And it’s not just us - there is a whole CopWatch movement that aims to record police actions and thereby hold them accountable. But easier said that done! Grabbing your iphone and turning it on the police is difficult for anyone to do, especially immigrant vendors who are vulnerable to repeat abuse. Often the officers don’t like it. And sometimes they even arrest you, which is what SVP director Sean Basinski discovered last month when he recorded a vendor/police interaction. To bring attention to this issue (and one fairly easy solution — requiring the police to wear body cameras, as other cities do) we held a press conference today in front of the Midtown North Precinct where Sean was arrested. As the police looked on from across the street, vendors spoke about their experiences and gave the NYPD notice that they should expect much more filming in the future. Recently, the NYC Department of Transportation has unveiled an exciting new “bike share” program, similar to those that have been successful in Washington DC, Paris, and other cities. This is exciting for street vendors — anything that makes the sidewalks safer and the air cleaner is good for vendors, who have to breathe car exhaust and diesel fumes all day. Just one problem: DOT did not pay any mind to vendors who would be displaced by the bike share stations! On Liberty Street in Lower Manhattan, five carts (employing 15 families) came to work one morning to find this (photo, left) in their spots. Bikes are good, but they should not displace immigrant small business owners who have no place else to go. So far we’ve asked for meetings, held a press conference, made a video, and done a picket outside DOT headquarters. All to get a bike docking station moved five feet! We’ll keep fighting until city planners and bureaucrats think about the marginalized groups, like vendors, they are affecting with their decisions! Victory does not come easy. But perseverance pays off. After years of fighting against Mayor Bloomberg and his $1,000 fines on hard-working street vendors, we won. By a final City Council vote of 44-3, the maximum vendor fine for minor offenses was reduced to $500. Lesser fines will also decrease, since the city will now penalize as repeat offenders only those who repeat the same offense. As Hugh Hogan from the North Star Fund recognized, this was a historic victory for working people and immigrants in New York City. Though we did not get everything we wanted, we won great respect for our unity, advocacy, and tenaciousness. We move toward the future. For now, thanks to everyone who worked so hard to help make this campaign a success. More than 90% of NYC street vendors are immigrants, so our community has a huge stake in the immigration reform debate currently brewing in Washington. While we may not be in the room with the unions, the chambers of commerce, and the “gang of 8,” we can still have a big presence in the streets. So we have. We marched on Washington last month and rallied at the May Day festivities in NYC with many of our friends and allies. We’ve also talked to many of our members about how not to get scammed by “immigration lawyers” during this hopeful time. We’ve also been throwing our support behind the exciting bill, introduced by Council Member Danny Dromm, that would give all NYC residents (citizen, green card holder, or nothing at all) the right to vote in municipal elections. This bill would remake the political map in NYC and give a voice to millions (?) of those currently voiceless. Let’s do it! Big, big news! Today we got word that Speaker Christine Quinn, who we have been pestering forever to call a vote on our bills to lower the $1,000 tickets, is ready to do so! And in fact she herself is now supporting our cause, making it very likely that the bills will be voted into law next week. After more than five years of work, and more than two years of legislative advocacy, we are getting very close to victory. Help Sully on Feb 15th! 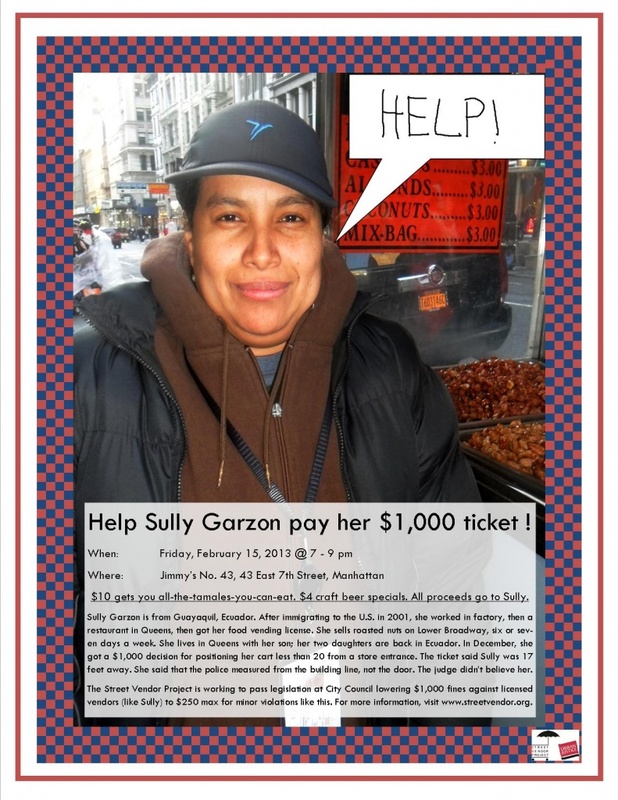 Help Sully Garzon pay her $1,000 ticket ! $10 gets you all-the-tamales-you-can-eat. $4 craft beer specials. All proceeds go to Sully. worked in factory, then a restaurant in Queens, then got her food vending license. She sells roasted nuts on Lower Broadway, six or seven days a week. She lives in Queens with her son; her two daughters are back in Ecuador. In December, she got a $1,000 decision for positioning her cart less than 20 from a store entrance. The ticket said Sully was 17 feet away. She said that the police measured from the building line, not the door. The judge didn’t believe her. The Street Vendor Project is working to pass legislation at City Council lowering $1,000 fines against licensed vendors (like Sully) to $250 max for minor violations like this. For more information, visit www.streetvendor.org. Good news! While the war continues, we have won a small battle. SVP settled a lawsuit last week that will put $228,000 back in the pockets of hard-working NYC street vendors. Due to a pesky “computer error” that the city apparently didn’t know about (otherwise they would have fixed it on their own, right?) the city was over-charging vendors on tickets for years. We found them out, and checks to vendors (like Mohammed Ali, left, who will be getting $971) are in the mail. Read about it in the NY Post if you like. But don’t think we have won the war — our campaign to permanently Lower the Fines is very much alive. And hopefully it will get a boost with this big victory. You’d think, with 20,000 or so vendors in New York City, elected officials would listen to us. Sadly that is not the case. They should, but they don’t. Many vendors are not U.S. citizens, so they can’t vote. And vendors are only now being organized into a group to have political power. In the meantime, we’ll use our other advantages — including the fact that vendors occupy some of the most valuable real estate in the city. Outdoor advertising in NYC is effective – ads on the sides of public telephones alone generate $62 million each year. Starting today, vendors across the city will be using their carts as billboards to encourage Speaker Christine Quinn to call a vote to Lower the Fines. We announced this advertising campaign today outside Penn Station. You can read more about it on Gothamist, Midtown Lunch, and in Metro and El Diario. Keep your eyes out for those signs – and read more about our campaign here. A week after being branded as terrorists by the fire department, New York vendors are showing their service in the aftermath of Hurricane Sandy, which left millions without power, transport, and food. Vendors, who don’t rely on any power grid, are perfect for such situations. Jetblue acted quickly, sponsoring eleven food trucks who served more than 25,000 storm victims. Our friends at the NYC Food Truck Association crowd-sourced $27,000 to serve thousands more. All across the city, vendors kept working, providing a beacon of light, warm food, and a little bit of hope in amidst all the bad news. Its great to see that NYC Council Speaker Christine Quinn wants to support small businesses. Last week she announced five measures that would help undo the “gotcha” culture that pervades at many agencies, including steps to decrease fines for restaurants. Great idea! But what about small business owners like SVP member Alassane Fall (left), who just got a $1,000 ticket because his table was allegedly one inch too high? All she needs to do is call a vote on two bills (Intros 434 and 435) that have already had a full hearing and already have the support of the majority of City Council Members. Speaker Quinn, we urge you to do so ! Please read more and take action here. SVP has played an active role these past 6 months in the growing citywide movement against stop and frisk, the controversial NYPD tactic that caused 685,724 people (almost all young black or Latino men) to be stopped, questioned and patted down last year, with no reason to believe they had done anything wrong. Stopping stop and frisk is the first step toward having a police department that treats all people, including vendors, with dignity and respect. In May, we began working with the Police Reform Organizing Project (PROP) our sister project at UJC who have been building a movement and generating a lot of dialogue on the issue. In June, we sent a contingent to the historic Father’s Day march. And last week, we collaborated with artist Aaron Gach, who developed a project to get vendors talking about stop and frisk with tourists, subverting the dominant narrative they receive about liberty here. We can’t explain it as well as Aaron, so check out this great article in the NY Times! New York is big enough. But we’re proud that we get to work with vendors in other cities across the U.S. One way is through the Vendy Awards, which now takes place in NYC, Philly, and Los Angeles. The 2nd Los Angeles Vendys took place this Sunday in Pan Pacific Park, and the whole SVP staff went out to soak up the sun. The winner was Chef Sumant from the fabulous India Jones truck. Here’s an event recap and a ton of photos. Thanks to our friends at LA City Farm and CHIRLA and the SoCal Mobile Food Venodors’ Association and especially the East LA Community Corporation for all their help in hosting us and helping put on the Vendys. Lately that has been the case in Bay Ridge Brooklyn, a once Italian-American neighborhood that has seen an influx of Arab Americans. While Sammy Kassen’s food cart has been serving up delicious food for nearly four years, lately a few brick and mortar shopkeepers and the local BID have gone to great lengths to remove him. A media firestorm in the quiet neighborhood, fueled by a shoving match, a fake protest by a local bar owner, and some illegal planters placed on the sidewalk to eliminate the vendor. While the brick-and-mortars cry “unfair competition,” its pretty clear the opposition is based on race and ethnicity. SVP is helping out with legal assistance and media support. As we say in this editorial, we hope that, instead of fanning the flames, elected officials can help broker some peace in Bay Ridge. It feels like we’ve been fighting for a lifetime. But the end might be in sight. Today the City Council will hold a hearing on the two bills we have been working on for nearly 18 months — Intros 434 and 435 — to lower the $1,000 fines vendors still pay for minor violations. It will be a good excuse to release the new report done by John Davis and Alfonso Morales from the University of Wisconsin – Fining The Hand that Feeds You. The report shows that lowering fines will put more money in the City’s pockets, too! And if you are not the reading type, just go and watch this gorgeous new video by Samuel Enblom. SVP was started ten years ago, not long after 9/11, when vendors were being kept from returning to work downtown, until we changed that. In the last decade, we’ve won lawsuits, held rallies, issued reports, given awards, and changed the way people think about street vendors, in New York and beyond. We’ve also built a community of 1,300 vendors who are together providing a voice to demand dignity, opportunity, and respect. Last week, we got together with a few hundred of our closest friends at Judson Church in the West Village. Thanks to Dana, Lizzy, and the whole team of volunteers who planned the event. And, of course, everyone who came out to celebrate. We raised nearly $10,000 to support our work – a thousand bucks for each year we’ve been open. Don’t wait for next year, view some photos from the event here. Its not easy fighting for the 99% when you’ve got the one-percenters like Dan Biederman lobbying against you. Biederman, head of the 34th Street Partnership, takes home $500K a year and lives in Chappaqua. He claims to know what New York should look like, but he’s best known for his privatization of public spaces like Bryant Park over the years. Last week he launched an unprovoked attack against vendors on the front page of AM New York, calling vendors “bad citizens” and “slobs.” You’ve got a right to your opinion, Biederman. But you won’t insult a whole population of people in this city without a response from us. We are New York. And you? Not so much. Our board wrote a letter demanding an apology last week. And then, with no response, we camped out in front of Biedernman’s office for a press conference today. Thanks to El Diario for covering it. And we’re just getting started with you, Biederman! You’ll be hearing from us! Getting a law changed at City Hall requires lots of closed-door meetings. But you also need to mobilize your grassroots, show yourself to be a powerful constituency, and keep your issue in the press. All that is why SVP, VAMOS Unidos and the 125th Street Merchants Association held a rally last week at City Hall to demand a hearing on Intros 434 and 435. A more rainy, ugly day we never did see. Our beautiful signs all got soaked. But more than 400 vendors were joined by five Council Members and tons of media outlets, like the Times, Daily News , Post, and WNYC. The message was simple : we need to lower the $1,000 fines now !